Available in single or double format. (For a Double Pocket System you need to purchase two Single Pocket Door Systems, a Double Leaf Conversion Kit - and of course 2 internal doors!). Internal doors that are being fitted into a pocket door system will need a groove machining into the bottom edge, to allow the door to fit into the floor guide. You can add the cost for grooving a single or double pocket door in the drop down menu above. You will need to purchase the doors at the same time. Take a moment to check your pocket door size requirements against our size guide tables. And don't forget, if you want to order a double pocket door, you will need to purchase two single pocket door systems and a double leaf conversion kit. ( View the Double Leaf Conversion Kit & Purchase here ). Whatever type of pocket door you choose, you'll need an accessory kit as the pocket door system cannot be installed without one. Choose from either white primed or varnished oak, available for both single and double pocket door systems. ( View & Purchase the Timber Accessories Kit here ). This might sound complicated and costly but it really isn't, it just needs to be done! Door grooving is when the bottom edge of the door is grooved to fit in the floor guide of a pocket system. Save your joiner or builder some time, as the JB Kind in-house joinery workshop can pre-groove your doors prior to delivery. It'll only be a small additional charge - see the drop down menu above. Whether you want a privacy lock for a bathroom or a flush door pull, we offer a selection of quality fittings. Make life easy and source all your pocket door purchases all in one place. ( View & Purchase the Door Furniture you require here ). 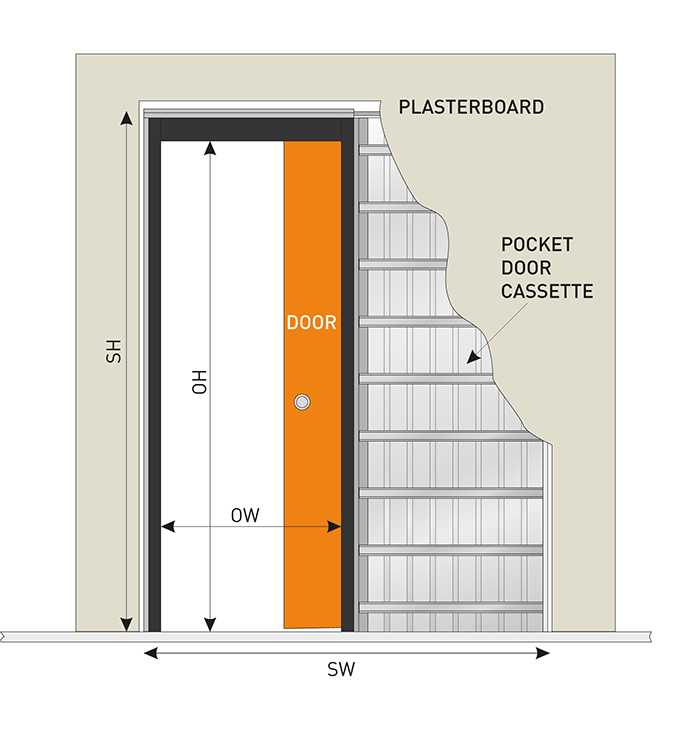 JB Kind Pocket Door System Codes - POCSYSSGL686 - POCSYSSGL762 - POCSYSSGL838 - POCSYSSGL915 - Must be fitted and treated to manufacturer's instructions. - We cannot exchange Sliding Pocket Door Systems after order - JB Kind Sliding Pocket Door Systems are supplied as a Special Order. Please order doors fom any other manufacturer on a separate order, otherwise the shipping charge will not be calculated correctly.